I am so happy to be joining 11 other talented bloggers that will be sharing our love for vintage. These cast iron flower basket door stops are one of my favorite collections. I was inspired by my cute friend, Joanne to collect them. In fact, she found 2 of the 3 for me. I bought the bunny for $5 at an antique store in Texas and found the little cart at a thrift shop for $1. The chicks beaks were all chipped. a little paint fixed them right up! 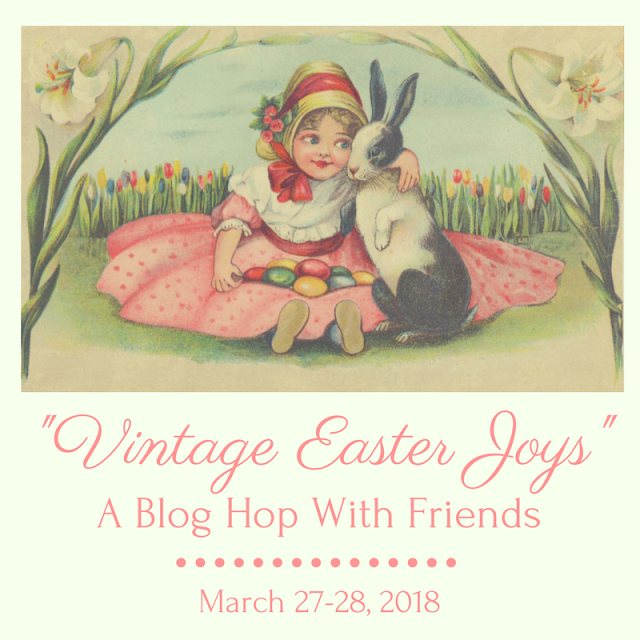 Not only is it a fun vintage hop, but please return on Friday to link up your own spring and Easter posts. Decor to Adore then I know that you have already enjoyed lots of eye candy! As long as I can remember, I have always loved creating scenes. Yup, long before I had ever heard of the word, 'vignette'. A mixture of old and new is what I consider a perfect (scene) vignette! A reproduction architectural piece, a vintage scale, an enamel pan that looks vintage, but isn't, and a few Easter treasures. Or maybe a couple of chippy corbels. These beauties traveled all the way home with me from Charleston, SC. Although I usually like to include at least three items in my vignettes, at times I like to keep them simple. Such is the case with this vintage laundry basket, olive bucket filled with dried hydrangeas from my Limelight tree, an old quilt top, and a simple birds nest. This watering can was joined by a vintage platter, some garden gloves, and an egg spray. 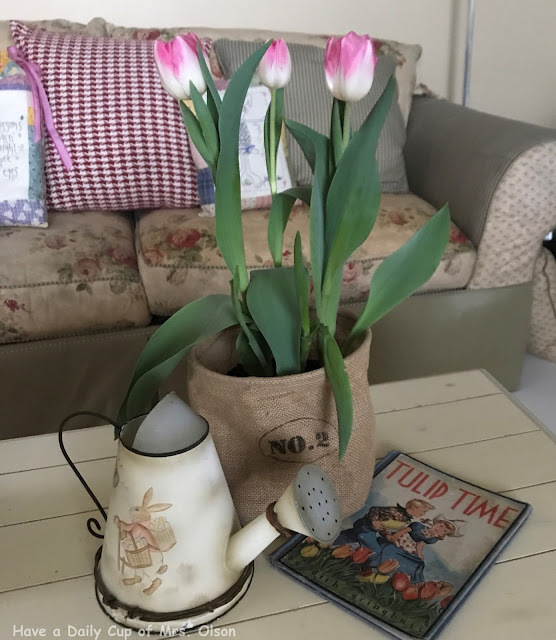 I bought some potted tulips at Home Depot. So it found a new place to reside for a few days. Just simple little things evoke fond memories for me. In the 70's it was very popular to be gifted little planters like this lamb when you had a baby. I wish I had some of my original ones. I scored this one for $2 at the same antique store where I bought the bunny in the first photo. I also remember my kids playing with these lace up cards when they were little. I have lots of vignettes on my kitchen counters. They make kitchen chores much more delightful! I recently purchased the toy sink and the fuzzy chick was a souvenir from a trip to Salzburg, Austria years ago. The basket and both sugar eggs were thrift finds. I added the plastic flower and velvet ribbon to the handle. Two of my girls saw them last week and loved them. They remembered getting one in their baskets as children. I love layering dishes with little vintage treasures on top. This old wicker scale holds spring time baking essentials. This sunbeam mixer really works, and I use it now and then. Sometimes vignettes don't turn out to be as fabulous as you imagine them to be in your head. lol! When I spied this Bo Peep cake carrier at Vain and Vintage in Pocatello, ID I squealed with delight! This will be awesome for displaying some of my sheep collection, I thought. It was a bit hard to work with and just wasn't what I hoped it would be. Still, I love seeing all of my little sheep corralled together. They are grazing in a field of green sugar. It's hard to get a decent photo in my kitchen window, but I love my kitty teapot and pastel teacups! I'll end with my latest vignette using the diorama egg I just made in craft group. If you would like to learn how to make one, go here. Now don't forget to hop over and see what vintage goodness Angelina from Petit Haus has in store for you. In fact, you won't want to miss a single post! Also, remember to come back Friday for our link party. Jann you're the coolest Easter chick I know! I adore all of your vignettes and your diorama egg is fabulous. May Easter's blessings be yours sweet friend. Adorable Jann! I am drooling over your wicker baby scale and that little yellow stove! Yes, playing with our vintage treasures is playing for adult women! Oh! Lots of pretties here! I am in love with your wicker scale! Happy Easter, Jann! My dear Jann, I don't even know where to begin! Everything, and I mean everything, is so cute, sweet, charming, and whimsical. I simply loved everything. Just so many things to look at and enjoy! I love your vignettes! What a fun blog hop! So sweet. The littles must love seeing the holidays at your home. Your Easter vignettes are adorable! I love your scale and I see you like to use the spiky flower frogs the same way I do! Jann, your Easter décor is wonderful. So many things to love. The little duck with the silverware inside is a cutie. The egg in the nest is beautiful and shows nicely in the nest. The joy is spread on thick at your house! Very sweet vignettes. I love your sheep collection. Happy Easter! you have so many adorable Easter goodies, Jann. love them all. I have to mention that wonderful blue enamel tub. so sweet! Your collections are amazing! I especially love the Kitty Teapot with the little cups - so pretty. I love your vintage Easter to bits! I even have one of the same postcards. And the eggs and nests are precious. Of course you know I'm mad about bunnies. Big smiles here! I just love your style, Jann! All your little vignettes evoke such sweetness and vintage style...so YOU! Happy Easter! Jann, you sure celebrate the season in grand style. Love ALL your little vignettes and your creativity. Wow, Jann, you really should be selling, as much as you love putting vignettes together. And what wonderful vignettes and collections! Of course I love your sheep, but that fluffy chicken from Austria and the ones whose heads you touched up - they're adorable! That pale blue enamel bowl - have never seen that color, is it one of the new ones? Pretty! Happy Easter my friend. Love our love of vintage goodness, and sharing it together is my Easter treat! Jann, it's always a treat to see what you have put together into a charming vignette or crafted with your group of friends. I love vintage holiday items, and have a few Easter pieces that I've picked up at antique shops or markets. This month our antiques group was treated to viewing a great little collection of vintage Easter candy containers and hand blown glass eggs. I need to put together a post on her collection, but just haven't had the time recently. Perhaps I can get something created before Friday. Jann, you are the queen of vintage vignettes! Your treasures are so unique and fun to examine. I always love seeing your vignettes on IG! I love your sheep collection! Love all your vintage Easter vignettes! Love the wicker scale, the sheep collection is so cute, will have to do something in my pink mixing bowl too! Love it all! So many sweet things to admire, Jann, how welcoming your home looks. How adorable,Jann!Great treasures...that sweet lamb planter caught my eye!! !Happy Easter! See what I was saying? My house has nothing in comparison to all of your wonderful vignettes! I used to make those sugar eggs with my kids! I should get my molds out again! Everything is always so charming and your energy level is out of this world!!!! Love you!!! Have a wonderful Easter!! Really cute ! Happy Easter ! I love all of your Easter decor, Jann, and enjoy all of your posts. 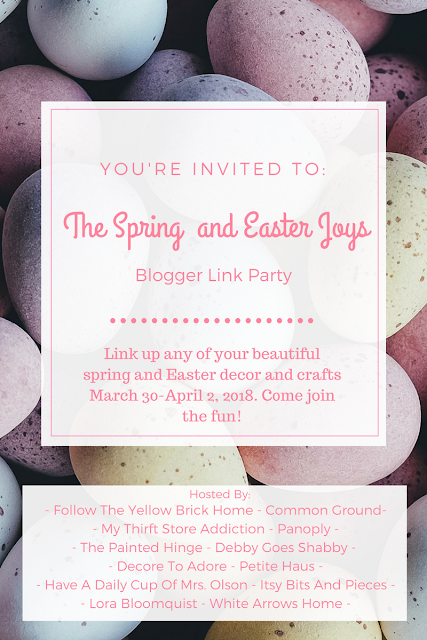 Thanks so much for hosting another awesome link party. I so enjoyed getting to participate. Hope your Easter was filled with joy. Out on the Porch for Spring. Playing with Plants and Purple Planters. . .
A Day at Magnolia. . .
San Antonio River Walk. . .